I’m very excited to announce that my ukulele lesson book, “Your First Ukulele Lesson and Then Some,” is finished! I’m also excited to say I’m giving it away for free. It’s simple. I wanted to put together a course that has everything you need to know about playing the ukulele in one location. The internet is full of a lot of great information about ukulele, but it can be a bit scattered at times, which can be frustrating. If you’re just starting ukulele, this book will be perfect for you. If you’ve been playing for awhile, you might pick up some new tricks including some unbelievably helpful ways to think about rhythm, and some new chords and songs. 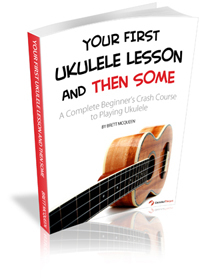 To get your free copy of “Your First Ukulele Lesson and Then Some,” enter your first name and email below to receive free instant access. Yes, I require your email, but this is just so I can occasionally send you tips, tricks, and lessons not found on this blog, and let you know about any future revisions to this book. Don’t worry, if you don’t dig it, you can unsubscribe at anytime. So what are you waiting for? Enter your name and email below to get your free copy of “Your First Ukulele Lesson and Then Some.” I promise it’ll be good.